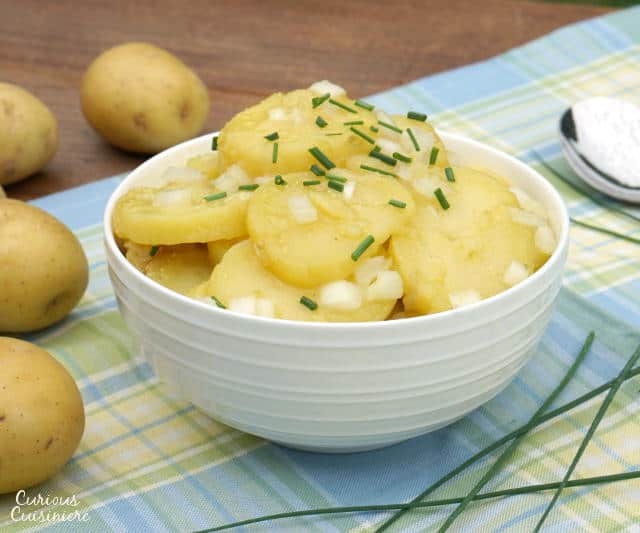 In South Germany you will find tangy and sweet Kartoffelsalat, a flavorful Swabian Potato Salad side dish that is the perfect accompaniment to a hearty German meal. 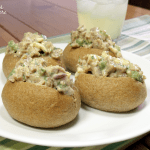 In the States, when we hear “potato salad” we tend to think first of American potato salad, with eggs, crunchy celery, and a generous coating of mayonnaise. It’s the cool and creamy dish that embodies the flavor of summer picnics. 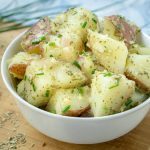 Honestly, I had thought potato salad was as American as apple pie, until I moved to a heavily German area, where warm German potato salad is just as common to see served up at picnics or in restaurants. Kind of like chowder in New England vs New York, you will find a pretty serious division in Germany when it comes to potato salad, called kartoffelsalat. In northern Germany, potato salad is made with mayonnaise. If that sounds like the popular American potato salad, you’re right. Our American version was brought to us by immigrants from northern Germany. Thank you! 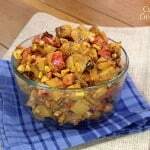 In southern Germany, a vinegar dressing is used, creating a sweet and tangy potato salad. But, even in southern Germany you will find regional variations. 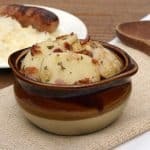 In Bavaria, to the southeast, you will find the vinegar-based potato salad laden with chunks of bacon or ham, and always served warm. This Bavarian Potato Salad is what we in the States typically think of as “German Potato Salad”. A little further west of Bavaria, kartoffelsalat is a bit more simple. But, no less tasty. In Swabia, to the west of Bavaria, you will find the kartoffelsalat (pronounced CAR-tauf-el-SAL-at) that we are featuring today. 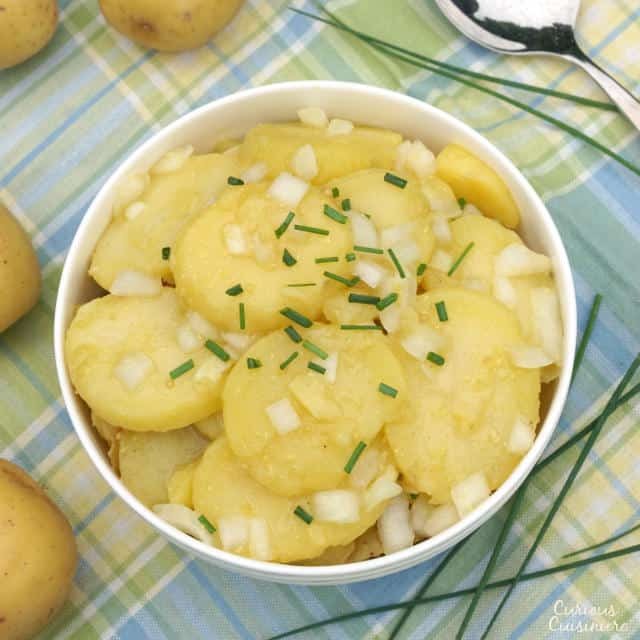 Known as Schwäbischer Kartoffelsalat, or Swabian potato salad, this version is like Bavarian potato salad, but without the bacon. 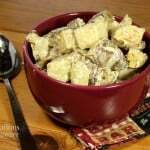 The flavors are similar, but the ingredients list is just a bit more simplified. And, while Bavarian Potato Salad is always served warm, Schwabischer Kartoffelsalat is more commonly served at room temperature. Both versions are great paired with sausages and schnitzel. And, while kartoffelsalat may seem like an every day kind of food, its is actually a traditional dish for special celebrations as well and is commonly found on the table for the German Christmas Eve feast. 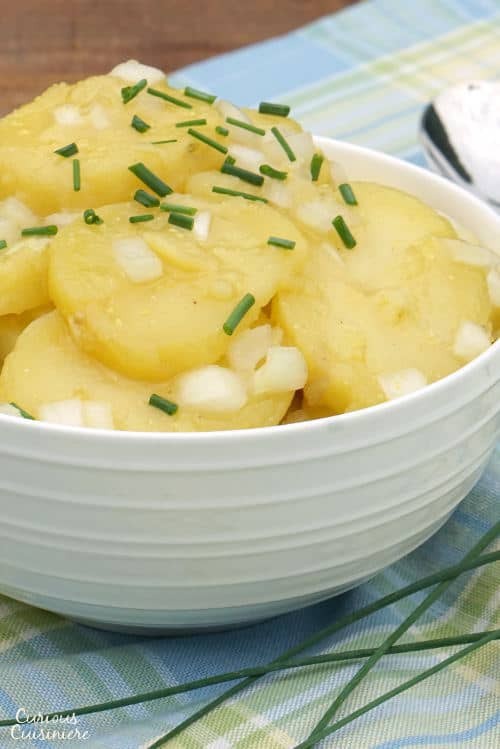 The potatoes used for kartoffelsalat are quite important. We first tried making this recipe with russet potatoes, but the floury russets just fall apart after being boiled. So, it is essential to use a potato that is slightly waxy. These potatoes will hold together better in your potato salad. We prefer to use Yukon Gold, or another yellow potato, in our kartoffelsalat recipe because they are a nice cross between a waxy and floury potato, giving a creamy texture to the salad, while also holding together well. 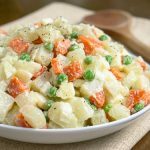 Our kartoffelsalat recipe is a bit less sweet than other German potato salads that are served in the States, but it is closer to the sweetness of the kartoffelsalat that we had while in Germany. 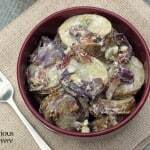 Get ready for a potato salad that will change the way you think about potato salad! For best flavor, let the potato salad rest for 1 hour during the preparation time. Place whole, peeled potatoes in a pot and cover with water. Bring the water to a boil over high heat. Reduce the heat and simmer the potatoes until just barely fork tender (10 - 15 min). Once the potatoes are cooked, drain them and let them cool slightly. While the potatoes are cooling, mix the hot beef broth, vinegar, mustard, sugar, salt, and white pepper together in a small saucepan. Bring the mixture to a simmer over medium low heat. By now, the potatoes should be cool enough to handle. Slice them into ¼ inch slices and place the sliced potatoes into a medium bowl. Add the onions and hot beef broth mixture. Mix well. Cover the bowl and let the potatoes stand for 1 hour to absorb the flavors. Once the potatoes have rested, add the oil and mix well. Serve immediately or refrigerate for 12-24 hours to let the flavors come together. 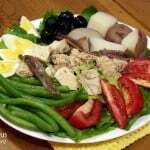 Remove the potato salad from the refrigerator for at least 1 hour before serving to allow it to come to room temperature. HI MY NAME IS MS, LYNETTE A MILLER I JUST WANT,ED TO LET YOU KNOW HOW MUCH I LIKE YOUR GERMAN POTATO COULD YOU PLEASE LET ME KNOW HOW TO CUT YOU POTATO IN HALF FOR JUST TWO PEOPLE I WOULD LIKE TO MAKE IT FOR ME AND MY DAD BUT WHEN I HAVE TRY,ED TO DO THAT I HOT MUCH IF THE INGREDIENTS AND I AM NOT SHORE HOW MUCH TO USE OK THANK YOU FOR YOUR TIME MS, LYNETTE A MILLER. Great to see this recipe. I grew up in Swabia and have seen a number of variation of this basic recipe. One I personally like is adding diced pickles and some of the pickle juices instead of or in addition to the vinegar. I also never add sugar. I also recommend giving it at least 4 hours for the flavors to blend and for the potatoes to became glistening (“schmotzig”in Swabain). Thanks so much for your tips Frank! Pickle juice sounds like a great substitution for the vinegar! Oh my goodness! I never thought to see the schwabischer-kartoffelsalat recipe! Well, maybe the recipe, but not the name! My Mom and her family always spoke Schwabisch, as did I when younger, so love to see this posted, and it really is an excellent dish! How fun! We hope you enjoy the dish!